Dr. King said “now is the time to make real the promise of democracy.” I demand full democracy for DC residents! If you use a twitter client like TweetDeck or HootSuite, you can schedule this in advance, or you can use a service like Future Tweets to do it. There’s no question DC is on the short of the representation stick, so get out and help raise awareness to the city’s unique plight. You need a hashtag for your tweet tomorrow! That way you can track its progress and reach! #OneCity #DCStatehoodNow. Just something so that the tweet can be searched and cataloged. That’s on the Mayor’s comms team to provide, I think, but #OneCity works for me. 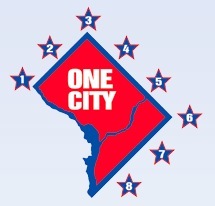 I fear #OneCity would look a little too much like it was a Gray campaign effort. Also the point is to be a state, not (just) a city. #DCStatehoodNow or #DCStatehood seems preferable. But as you say, the mayor’s people should provide something.